The 2017 Bow Seat Ocean Awareness Student Contest is now open for student entries, originating from any part of the world. 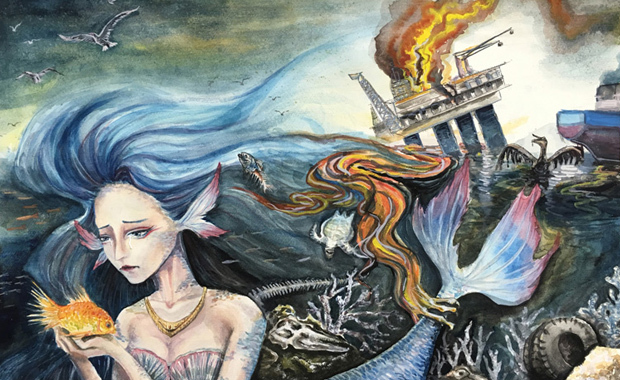 Bow Seat’s annual Ocean Awareness Student Contest challenges all middle and high school students around the world to create works of visual art, poetry, prose, or film that speak to this year’s theme – Ocean Pollution: Challenges & Solutions. The Contest is completely free to enter, and students can earn awards up to $1,500 in each of the four competition categories! Bow Seat recognizes the power of our young ocean caretakers, and wants to inspire them to lead the way to finding innovative solutions to ocean pollution. You may choose to focus your work on one type of pollution, or the impact of ocean pollution as a whole. Whichever way you choose, Bow Seat wants your submission to make viewers reflect on the impact of ocean pollution, inspire them to consider possible solutions, and challenge them to take action. The Ocean Awareness Essay Contest was launched by Linda Cabot in 2011 as a companion to her film, “From the Bow Seat”, an environmental documentary she filmed while sailing the Gulf of Maine with her family, including her two teenaged daughters.